Laser battlefield Dundee – Shoot to thrill! Scotland’s largest indoor laser battlefield is now open at ScotKart on Myrekirk Rd, Dundee. When you hear the words “laser tag”, most people think about 80s-era plastic toys and black-lit rooms in the back of a bowling alley like the old ‘Zap Zone’ in Dundee. Combat City tactical laser tag is very different – think instead about a realistic combat simulator designed for the modern age. Combat City launched at ScotKart in Cambuslang, Glasgow in 2012, and has proved remarkably popular for all ages, whether it’s a few friends enjoying a couple of Missions, or a Birthday Party, Stag/Hen Do, Youth Group, or Corporate Event. It’s great to now launch a laser battlefield at the Dundee karting centre, using all the knowledge gained from the original site, which is rated a 5 Star Activity Centre by VisitScotland, and has won numerous awards. Located within the ScotKart indoor karting centre at Dundee, Combat City features real world style weapons and a themed battlefield, which offers Scotland’s largest indoor laser tag arena. Within the battlefield, players can take part in a variety of missions to keep the challenges unique and interesting. Some are about rescuing hostages, while in others you might need to defend a police station, or capture command posts. 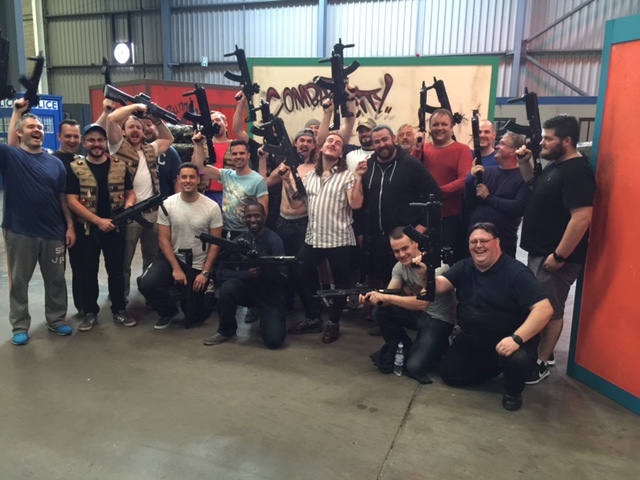 Combat City battlefield Dundee is available for private parties and corporate team building events, and open for public ‘open play’ hours the rest of the time. There is a cafe serving soft drinks, quality coffee, snacks and hot dogs. Facilities include 3 Birthday Party rooms, and a Corporate Suite for meetings.